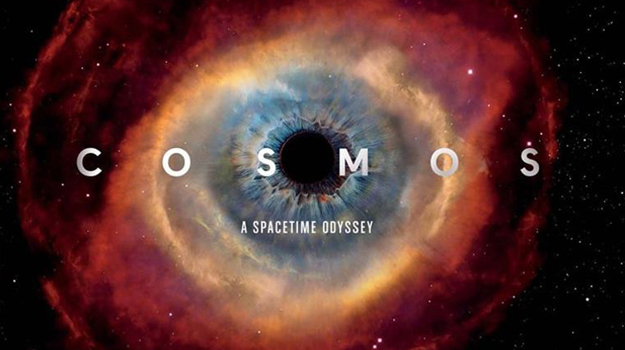 The first episode of the new COSMOS did not disappoint. Will it be the equal of its predecessor? Hard to say after just one episode - but nothing I saw leads me to think that it will be anything but spectacular and on a par with Sagan's pioneering work. It is sort of a waste of time to try and convey the new COSMOS in words. You simply have to watch - and feel it. I liked what I saw and I have to say that my concerns about Tyson trying to fill Sagan's shoes - and missing - evaporated instantly. Tyson reverentially took the small dandelion seed last held by Sagan a generation ago, and then shot off - confidently - in his re-imagined ship of the imagination. I have lived with the original COSMOS in my head for more than 30 years. It is not going to go away and I am incapable of not comparing the new and the old versions. Both series are boundary-pushing creatures of their respective times - and hosts. Yet millions have never seen the original. I will save my overall commentary on the new incarnation of COSMOS until I have seen the entire collection of episodes. But I can talk about the original series and how it and its creator, Carl Sagan, affected me personally. Inextricably linked as these two stereoisomers are, insight into one provides a possible prediction of what impact the other has had or will have. The original series was hosted by the original science geek mega star, Carl Sagan. COSMOS was unique even in its own time. Using the uninterrupted PBS format, state of the art special effects, and flawless writing, the original COSMOS (and its companion book) brought together a wide range of seemingly unrelated ideas. No one had quite mixed biology, sociology, cosmology, history, geology, and astronomy as COSMOS did. Today, we call this fusion "Astrobiology." More on that later. In the 1980s, it was common practice for high-end PBS series to have a companion book. There was no Internet back then, so in order to get more background on the topics raised on TV, you had to refer to books. Many of the books produced for PBS series were outstanding works in their own right. Some were better than the TV show itself. The companion volume for COSMOS went quite a bit further. It was - and still is - simply splendid. Again, a decade before the Internet, when home VCRs were still not all that common, once you watched something on TV - that was it. In the case of COSMOS, the official companion book was like a printed version of what we'd call a "website" today. The book simply served to further embed the myriad of threads COSMOS brought together - and did so years after COSMOS vanished from television. Its just a beautiful book. Alas, the new COSMOS does not have a book. It does have a website and an App that has yet to be released. And instead of waiting for a book, the Internet itself exploded with vast numbers of tweets and postings. In 1980 we sat and watched COSMOS on a TV screen. The new COSMOS invited us to participate - and help shape its own reception - in real time - everywhere. The original COSMOS companion book has been re-released as an ebook - alas, with none of the lavish illustrations. While the greatest aspect of COSMOS was the words chosen to accompany the majestic vistas on the screen, reading the ebook without the images is to look at a ghost of what the original book encompassed. I certainly hope the producers reconsider this oversight and re-issue the original book in all its glory. For me, COSMOS was a personal experience - one that has never left me. I saw it at a time when my education and my future careers were about to intersect. Its imagery and ideas affected me as I went on to finish by biology degrees and then work for, around, and within NASA. I was not alone. Indeed, if you watch the opening episode it says "by Carl Sagan" which is replaced by "A Personal Voyage". At the end of the new COSMOS, Neil Tyson makes mention of his first meeting with Carl Sagan when he was a teenager. He does so sitting in the same location on the California coast where Sagan first launched COSMOS more than a generation ago. A personal voyage indeed. I know dozens of people who can trace their careers directly back to their interactions with Carl Sagan. I know many more who can point to instances where a NASA scientist or university researcher took them under their wings and, in so doing, launched a career. This still happens today but, well, with the Internet the process of touching people is simplified and complicated by the very same technologies we now employ. That said, the President of the United States introduced COSMOS the other night urging people to learn and explore. Maybe this new COSMOS will get people thinking about mentoring the next generation once again. I did not know Carl Sagan - I only met him once (briefly). But, like others, I have certainly encountered his influence again and again and again. My first introduction to Carl Sagan was in 6th grade when I took out a new library book titled "Intelligent Life In The Universe". Sagan co-wrote this book (actually, he edited and expanded a translated version) from a distance (it was the Cold War after all) with Russian scientist I.S. Shklovski. This book is where I first saw scientific nomenclature, equations, poetry, and artwork on the same page - where biology and cosmology often occupied the same sentence. This was my first introduction to the as-yet unborn field of Astrobiolgy. It is also where I picked up an odd habit that I still have: drawing little triangles in handwritten notes and in text books to accentuate passages. If you have read the book you know what I am referring to. This book also introduced my to space flight hardware - a preview of my future career. Pictured in the middle of the book was "Gulliver", a proposed life detection experiment for a future Mars lander. I was so taken by it that several years later I built a quasi-functional replica for science class out of household items and an old fishing pole. A small garbage can was its outer payload shroud. No one at school - including my teacher - knew what to make of it. When COSMOS first aired in 1980 I was helping to close down Jerry Brown's 1980 Presidential campaign in Los Angeles. I did not have a TV at home so every Sunday I'd head over to the campaign office to watch COSMOS on the largest Sony Trinitron there was - the widescreen TV of the day. It was mesmerizing. Working for Jerry Brown I had a lot of interesting opportunities including the Voyager Saturn encounters at JPL which overlapped with the first run of COSMOS on TV. For me this was rather exciting to say the least - I'd see things on TV and then be in the same room with the people making things happen the next day. Heady stuff. In the late 1980s I bumped into Sagan in print again. I was running research proposal peer review panels for NASA's old Life Sciences Division. Among the topics of the proposals under review was exobiology, the more focused precursor of what eventually morphed into astrobiology. In the new COSMOS, Neil Tyson notes the pervasive influence Sagan had on NASA's research. Sagan did this by managing to get himself included on virtually every mission team or working group there was. As such, when proposals were being reviewed, his resume was included with the other team members. Sagan;s resume was thick. Everything he wrote was included. I can recall wondering about this since no one else really did this. It soon became clear that this propensity for being asked to explain things to the public was an asset that many mission teams liked to have. And Sagan's resume was a living thing. I recall one time when there were two proposals under review for different things. Sagan's resume for one proposal had a "last revised" date that differed from another resume he submitted for a different proposal by a week or so - and yet one resume had an additional page of citations/publications. He was THAT popular. My only personal encounter with Carl Sagan was in 1988 at the First Space Life Sciences Symposium for which I had organized the logistics. Sagan was about to go onto the stage to speak . I handed him his laser pointer. Recall that this was 1988 and these things were the size of flashlights. I said "Here's your SDI - Star Wars - Laser pointer" I said to Sagan. A big opponent of the Reagan Administration's Strategic Defense Initiative aka "Star Wars", he laughed at my pun and then took the stage. He then shamelessly ripped me off and repeated my pun - and the audience roared. How awesome was that: Carl Sagan stole my joke! In August 1996 I was helping to run a large meeting of biologists in Seattle. Some big news from NASA broke: ALH84001 aka the "Mars Meteorite" announcement. Although the news evolved later, for that one day I got to walk from one session to another saying that NASA was announcing evidence of life on Mars. I had tears in my eyes - this was something I (a space biologist) had waited my whole life for. At NASA headquarters that day one of the presenters at the announcement closed by quoting Sagan saying "extraordinary claims require extraordinary evidence". As I rushed from one session to the next with this news, Carl Sagan lay dying a short distance away from me. He passed a few months later in Seattle. NASA's Astrobiolgy program was shocked into existence in the aftermath of the ALH84001 announcement. My last encounter with Sagan's influence was after his death. I was a participant in all of the workshops that led to the creation of NASA's new Astrobiology program. As we went through working groups and defined what this new discipline would be called we constantly found ourselves referring to things that had been so clearly thought out in COSMOS and other things Sagan had written or produced. The fact that virtually everyone in these meetings (hundred or more) knew Sagan personally is a testament to just how influential he was and how his ideas affected what we were creating. Neil Tyson was not exaggerating. Even people who did not like Sagan found themselves weaving his memes into their projects. I was really inspired by these meetings and bought the domain astrobiology.com. Google the term "astrobiology". My site regularly outranks NASA's sites in search results. COSMOS stood alone for so long as a collection of 14 episodes of memes and visions. I thought it would be hard to accept the notion of a sequel. To be honest, I always felt that the movie "Contact" was the sequel to COSMOS. Sagan's one work of fiction (that I know of) brought together every notion of awesome cosmic immensity that he had discussed in various places blended with a very personal revelation of our own personal place therein. At the end of Contact, the last frame shows a simple "for Carl" as a bookend of sorts to COSMOS. As I watched the opening of the new COSMOS the other night, I felt something familiar - it was the music. Just as those last piano notes played I realized what the screen would show an instant later - that the composer was Alan Silvestri who also wrote the score for "Contact". As such, these three compositions have been joined together - at least for me. Again, the new COSMOS has yet to totally reveal itself. Many viewers have never seen the original series, so this is a first time experience for them. For me its a chance to revisit the old COSMOS of which I am so fond as I embrace a new one - one that will hopefully have a similar effect. Then I will have to wait until I am in my 90s for the cycle to begin anew once again. Just like the real Cosmos. The new incarnation of \"COSMOS\" hosted by Neil deGrasse Tyson debuted the other night. Highly anticipated, this new effort seeks to reboot, rekindle, and revitalize the indelible impression that its predecessor, hosted by Carl Sagan, made on many of us back in 1980.